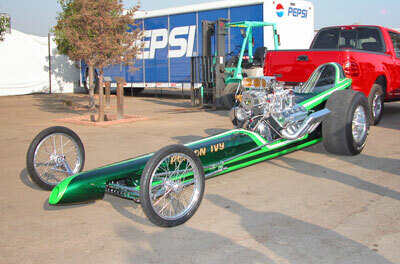 The "Poison Ivy" AA/FD was one of the many "local" project dragsters built in the 1960's. 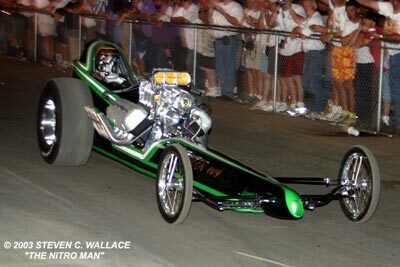 In 1964 San Diego native Frankie Martinez built the body and Ted Miller did the paint and lettering. 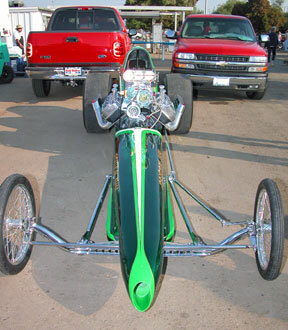 The jury is still out on the chassis builder. 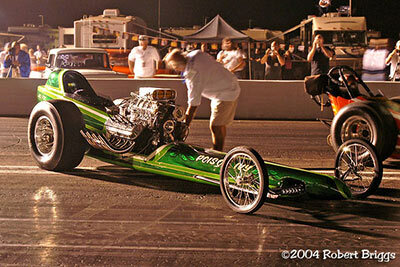 Aside from being a drag racer, Martinez was a talented auto body guy and custom car enthusiast. 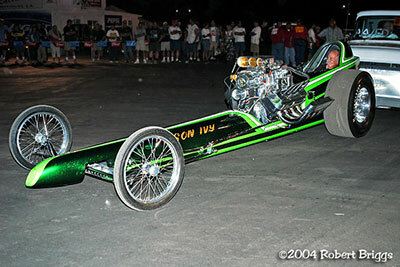 He wanted to test his talents and fabricate a dragster body like no other... and he did a fine job. 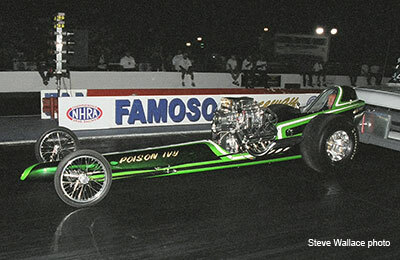 Poison Ivy was/is one of those cars you either like a lot or wonder what he was thinking. 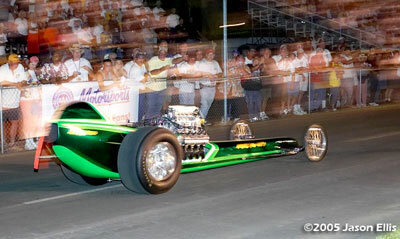 To put icing on the cake, Martinez had Miller do a wild green paint job - beautiful but at the time a racing no-no. 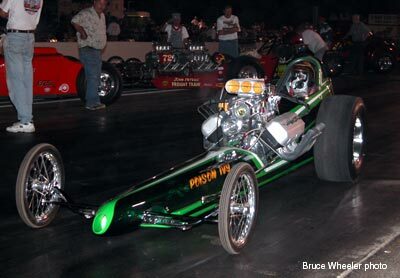 Green paint - unusual body = Poison Ivy. 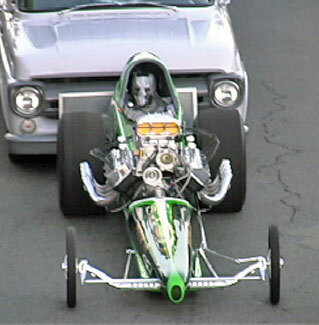 Also, like so many teams with limited budgets, the car was lightly raced and not competitive. It only ran a limited schedule (when money allowed) during 1965 and part of 1966. 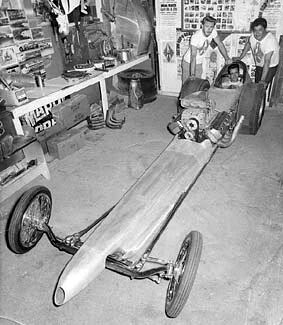 Martinez parked it in favor of business interests and it sat dormant until it was purchased in 2002 for a new life as a cackle/show car. 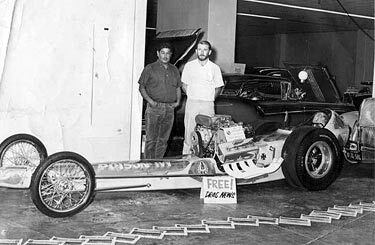 Frankie Martinez, Ted Miller and helper with the car before paint. 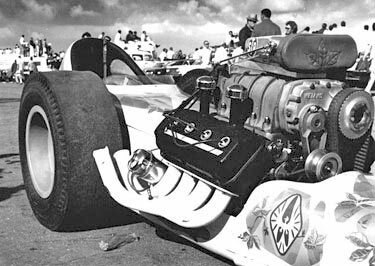 Carlsbad in 1965. 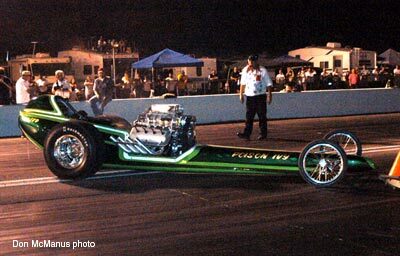 The car wasn't much in the performance department but it sure was pretty. 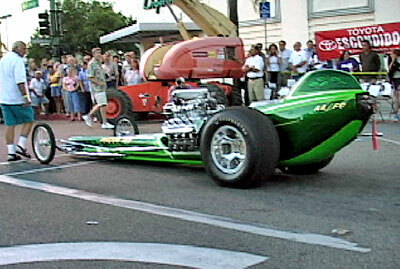 However, he did get a lot of flak for having a green car. 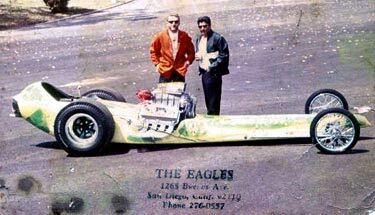 Bob Martinez owner/builder/driver and Ted Miller, the painter. 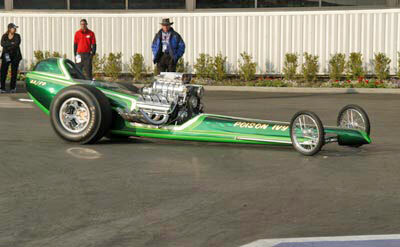 Originally built, owned and driven by Bob Martinez, Poison Ivy was purchased and restored by Bob Deburn from San Diego in 2002. 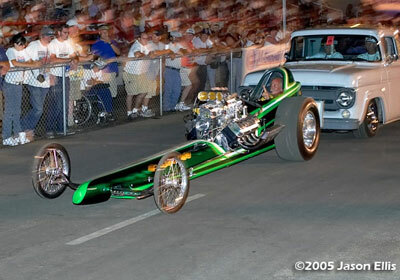 It made its Cacklefest debut in 2003. 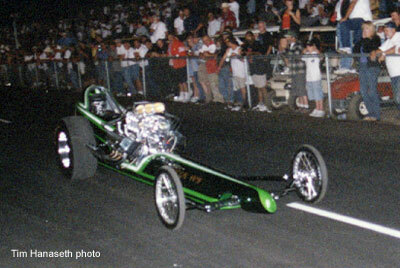 In the pits 2003 CHRR. 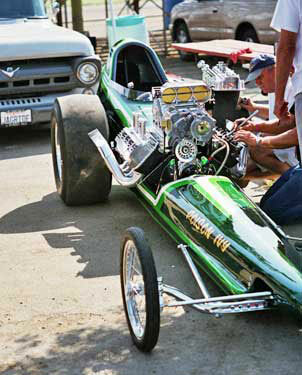 As is mandatory now, the Poison Ivy crew did a test push start prior to Cacklefest IV with Don Irvin, who heads up a NHRA Safety Safari crew at nostalgia drag racing events, in the seat. 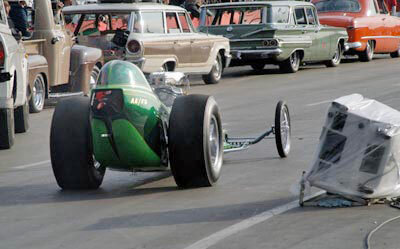 The nifty 57 Ford F-100 pushing Poison Ivy belongs to San Diegan Ray Lake. 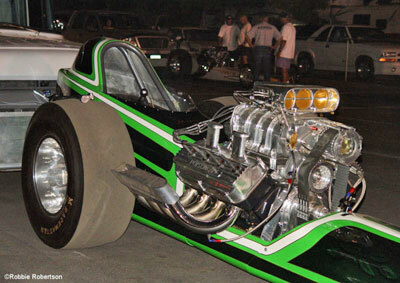 It has full front and rear Jaguar suspension and a Ford motor. 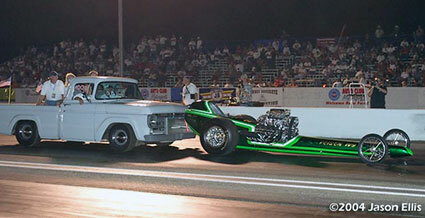 Ray makes his truck available for push start duties at a number of Southern California venues! Thanks Ray. 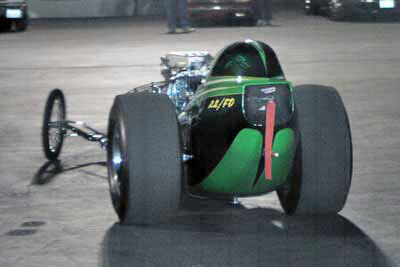 Irvin fired and on his way to the track during Cacklefest IV. Irvin in his spot for Cacklefest IV. 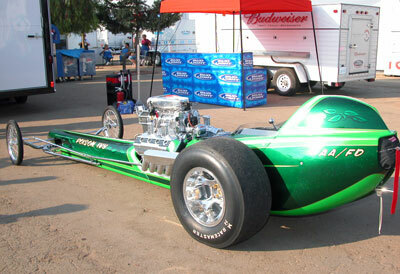 The cars next outing was the 2004 NHRA Winternationals at Pomona. Again, Don Irvin was in the seat. 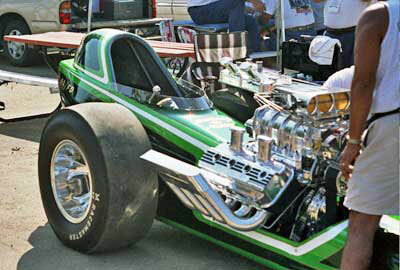 Like many of the cacklecars, Poison Ivy spends most of its CHRR weekend in "The Grove" behind the grandstands at Bakersfield. 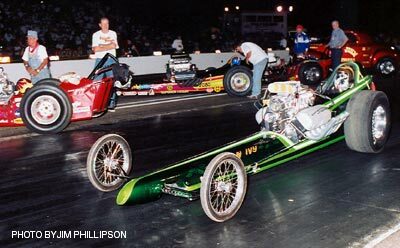 These photo is from 2004. 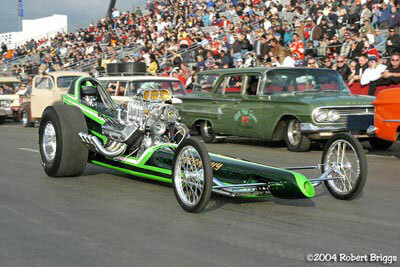 Back for Cacklefest V with Don Irvin at the controls. 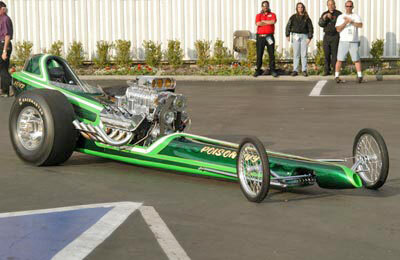 In the summer of 2005 Poison Ivy was a featured car at the second annual Big Rail Review in Escondidio, CA. Big Rail Review is a result of Bill Pitts fertile imagination. 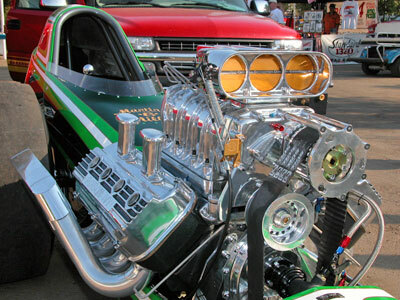 Bill, who also owns the Magicar, arranged with the promoters of the Escondido once a month summertime "Cruisin' on Grand" to provide Nitro burners to cackle for the enjoyment of the participants and onlookers as well. 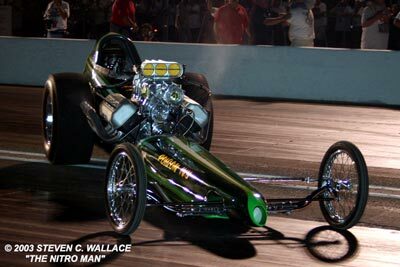 The third such event will feature about 20 cars and will be held August 18th. 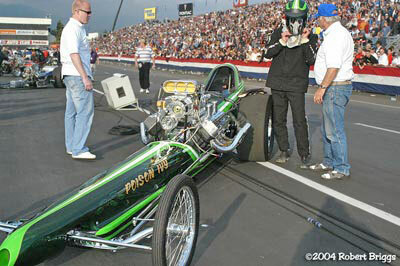 Poison Ivy was back for its third Cacklefest appearance in 2005 with a new owner, Ken Blackmore. 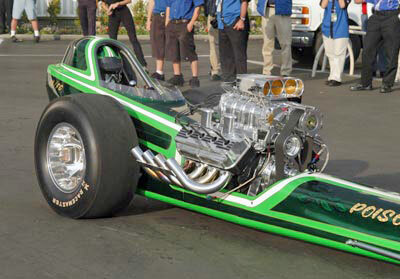 Blackmore, who is a highly successful building contractor from Temecula, has engaged the services of former Junior Fuel standout, Jay Carpenter, to maintain and present the car at the various venues. 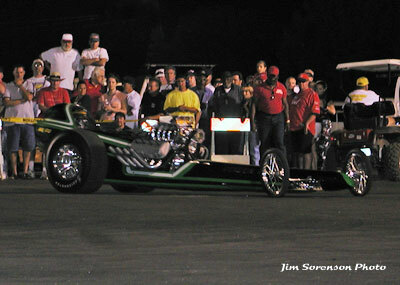 New owner - same driver... Don Irvin stayed in the seat as seen here in the Cacklefest VI parade. 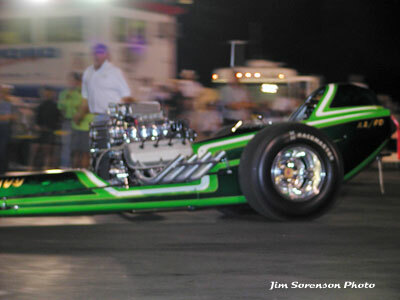 Unfortunately there are no shots of the car after it headed up track for Cacklefest. Someone said it lost fire and went off to the side. But you can bet it will be back this year.